Follow this proven two-step system to making sales! 1 - GIVE AWAY my 23 page Keyword Secrets Revealed lead magnet with your name and affiliate links in the report! 2 - Send my 13 part follow up system (to people who request the report) with your affiliate links in the emails! Anyone wanting to drive traffic will want these products! Do you want to sell affiliate products online using email follow up? If you answered yes, congratulations. Why congratulations? And now I'm going to share my follow up sequence for selling affiliate products to anyone who wants to get more traffic with a select few buyers like you. How to combine CONTENT with SOLOS to make sales! YOU WILL RECEIVE my 23 page special report about getting more traffic by choosing the right keywords. This is an area where people have many questions ... they want this report! It's called Keyword Secrets Revealed and is an easy to understand look at how to choose keywords that help you drive traffic and make sales ... two things almost everyone wants! ANYONE WANTING TO DRIVE TRAFFIC IS A GREAT PROSPECT FOR THIS! That means you have a huge market to work with. This helps create passive income as those who download the report click YOUR links for the recommended resources. YOU ALSO RECEIVE my 13 messages email follow up series. This series follows my proven Breathing Method™ which sends one helpful content message followed directly by a solo ad. The content message uncovers the problem and the solo offers a solution. This is exactly how I market online and has worked for me for over 17 years! But these are not just any messages! They have been especially written (by me) so that you can insert any SEO product you want into the messages! I even recommend which products I would promote while still giving you the choice! Not sure what to promote in this space? I've got you covered! YOU ALSO RECEIVE my PRIVATE SPREADSHEET of 79 highly converting SEO products and services. This is important because it empowers you to mix and match the products you want to promote! YOU ALSO RECEIVE a copy of my squeeze page so you can build your list while giving away this free report! And if you need help getting your squeeze page on the web my personal WordPress webmaster will do it for you for only $50! I have chosen 79 top converting products, using my own experience and my exclusive Product Matrix, to help ensure your best possible results! EACH OF THESE PRODUCTS HAS A FREE TO JOIN AFFILIATE PROGRAM! This series is designed to appeal to people who want to make money online either by building an online business of their own OR by promoting hot programs or affiliate products. There is nothing sweeter than passive income, and several of these powerhouse products pay you monthly. 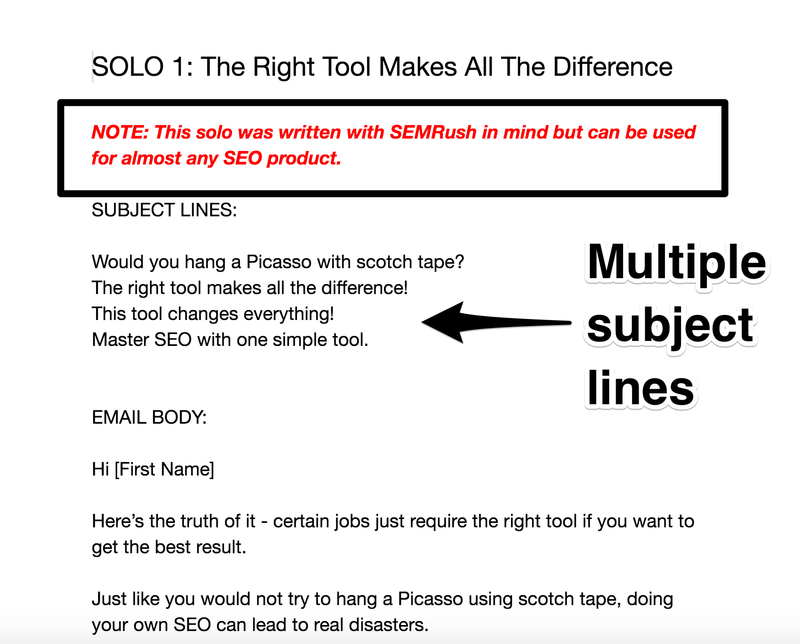 Each solo offers you multiple subject lines and places to enter your affiliate links! This image is a sample of the email messages. If I were to write this series for you individually it would cost at least $1300. I have long charged an average of $100 per message when writing custom follow up systems. If I wrote the report for you it would cost a bit more than $500. Your total cost to have this custom written by me would be about $1800. If you took my online course about email marketing you would pay about $1000 ($970 to be exact) and have to watch lots of videos, download templates and more. If you did that you would know how to write the messages but you will still need to do the writing! ALL YOU DO IS ADD YOUR NAME AND AFFILIATE LINKS TO THESE MESSAGES. You get $1800 worth of copywriting for A ONE TIME PAYMENT of $297.